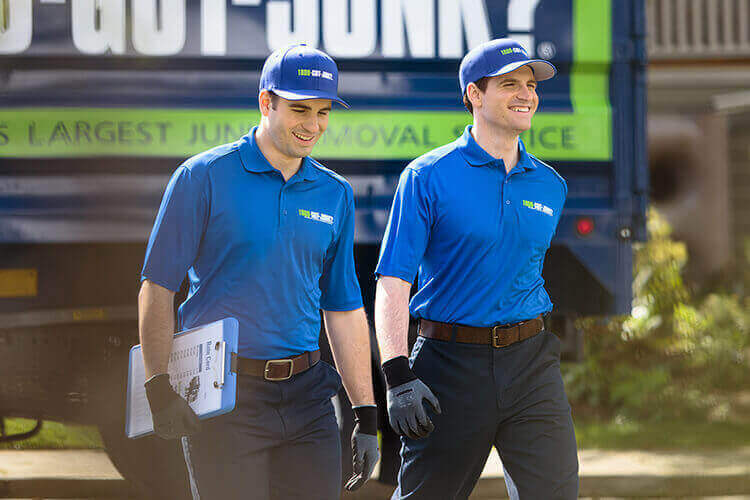 Computer Removal; Pickup & Disposal | 1800-GOT-JUNK? With increased technological advancement also comes an increased amount of obsolete equipment. Computer recycling is important now more than ever, with shiny new gadgets rapidly popping up on the market every day. If you need a hand getting rid of your old computers, laptops, monitors, and fax machines, 1-800-GOT-JUNK? can help! Whether it’s a few small items from your home, or a bigger load of old equipment from an office or school, we can handle it. We avoid the landfill and focus on recycling or donating as much as we can. If you need to make room for some new gadgets, let 1800-GOT-JUNK? handle take your old computer off your hands. 1. Simply schedule your computer pick up online or by calling 1-800-468-5865. If you have sensitive data on your hard drive that you would like destroyed, you can ask us for a certificate of destruction. Technology is advancing at a rapid pace these days, which means that people are replacing their laptops, computers, and tablets much more often. The problem comes when people decide to get rid of their old computers, which can end up in landfills and cause damage to the environment. Computers, laptops and old devices contain a variety of recyclable material such as silicon, tin, aluminum, iron, cadmium and plastic. Computers are also sources of valuable metals such as copper, aluminum, lead, gold and palladium, which can be melted down and reused over and over again without altering their properties. When a computer is recycled, these materials are extracted and broken down into their raw components, like glass, metal, and plastic. The raw components are then reused and made into new products. In order to ensure these items get properly recycled and don’t just end up in the landfill, you’ll need to take these items directly to the recycling facility. If you need help getting rid of your old computer, you can always call 1-800-GOT-JUNK?. We’re computer recycling experts and will get those old computer parts out of your way in no time! We’ll handle everything for you, ensuring that your items are taken to the right place for recycling and proper disposal. Can I Throw old Computers in the Trash? When you throw your old computers out with your household rubbish, there are a few things that can happen. Firstly, there’s a small chance that someone might salvage it before it gets collected, but it’s pretty unlikely that this will happen. If it gets picked up with your regular rubbish, it’s unlikely that it will get separated for recycling. Once it ends up in the landfill, it sits there for years to come, where the toxic metals and flame retardants contained inside can slowly leak out, damaging the soil and potentially even the water supply. If you want to ensure this doesn’t happen, you’ll need to make sure it goes directly to a recycling facility. The recycling facility will then use mechanical shredding and a high-tech separation device to take out the usable metals, which can then be sent to a smelter to be melted down and reused. Plastics and other materials will be separated out at this point too, and will be reused where possible. If you want to ensure your old computer doesn’t end up in the landfill, you can trust 1-800-GOT-JUNK? to handle your computer disposal for you. We’ll remove your old computers right from your home or office and make sure they are reused or recycled where possible. Why is Proper Computer Disposal Important? Many computers contain harmful materials such as mercury, lithium-ion, lead, dioxins, polychlorinated biphenyls (PCBs), chromium, radioactive isotopes, and cadmium; which cause harm to the environment if they are not disposed of properly. That's why landfills don't take them and you can get hit with fines if you put your old computers out with the rubbish. Recycling also recovers valuable rare earth metals and precious metals which are in short supply, as well as plastics. These can be reused in new devices after purification. Because we want to protect the environment, we recycle and donate computers everyday. When you call 1-800-GOT-JUNK?, you can rest assured that we will dispose of your computers responsibly. We recycled before it was cool.